As we fast approach another weekend in the British Wrestling calendar, we head to Wolverhampton for Fight Club: PRO before heading south to Bristol for Pro Wrestling Chaos' first show of 2016. We'll also have a brief look look at a few other shows coming up. Let's get Ready For The Weekend! Friday night sees the weekend kick off in Wolverhampton with Fight Club: PRO All The Best 2016 at The Planet Nightclub. The event will see the 2014 Infinity winner, Chris Brookes compete against a new face to the Fight Club: PRO ranks, Travis Banks. Brookes had a change of mind since winning the Trophy, being as dangerous as he ever has been. Banks, originally from New Zealand has been making a name for himself all over the UK in the past few months. His debut at Fight Club: PRO may be his most challenging debut yet as his opponent will have no problem in making his first match his last. From one former Infinity champion to the current champion, Pete Dunne. Dunne's rise during 2015 had the entire British Wrestling community talking. His opponent, Tyler Bate is another man who has gone from strength to strength in the last 12 months. While Dunne is constantly getting better, his momentum could be stopped by a man who has his own ambitions for 2016 and one of those is becoming the Infinity champion. While Fight Club: PRO is stacked with home-grown talent, there'll also be some international flavour on Friday as 'The Carolina Caveman' Trevor Lee makes his return to face Trent Seven. Last time, Trevor Lee defeated fellow American, Andrew Everett, this time however he faces Trent Seven, a man who holds the record for the longest Fight Club: PRO Championship reign. While Lee has had success before, and currently holds TNA's X Division Championship, he now faces a man who is part of the foundations of Fight Club: PRO, 'The Super Don' Trent Seven. KYS (MK McKinnan & Damian Dunne) vs ??? Moving on to Saturday and Pro Wrestling Chaos are back at the BAWA Club in Bristol with Everyone Must Stand Alone. The event will see the beginning of the Knights Of Chaos Tag Team Championship tournament. The first quarter-final match will see Massive Party's Chuck Cyrus & Robbie Caine face the duo of Eddie Dennis & Alex Steele. Cyrus & Caine have had tag team success in other promotions and will be looking to continue that success in Pro Wrestling Chaos. Their opponents, Dennis & Steele have been a part of Pro Wrestling Chaos since it's inception and will be keen to be a part of another piece of the promotion's history. Speaking of history, February 6th shall see a first time ever meeting between Pete Dunne and British Wrestling legend, Johnny Kidd. As we have already mentioned, Pete Dunne is a man on the rise right now. That rise is partially due to his style which combines hard hitting offence with a more traditional World Of Sport technicality. When it comes to World Of Sport technicality, there are few who can match Johnny Kidd. This is very much a match of New School vs Old School but a winner is impossible to predict. The main event this Saturday will see the winner of the Chaos Rumble, Jeckel waste no time in utilising his number one contender status as he challenges Wild Boar for the King Of Chaos Championship. Jeckel has been tearing through the Pro Wrestling Chaos ranks for months with no-one safe from the heavyweight. Boar on the other hand has been involved in a war with Mike Bird for the past few months with him eventually ending the war with the King Of Chaos Championship. However as one battle ends, another looks to begin in the shape of Jeckel. Both these men are harsh, heavy hitters who will go to any lengths to win. 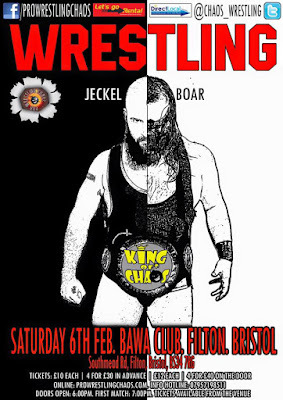 With Jeckel also having the new Pro Wrestling Chaos owner, Pariah Khan in his corner, Wild Boar faces a big challenge in Bristol. 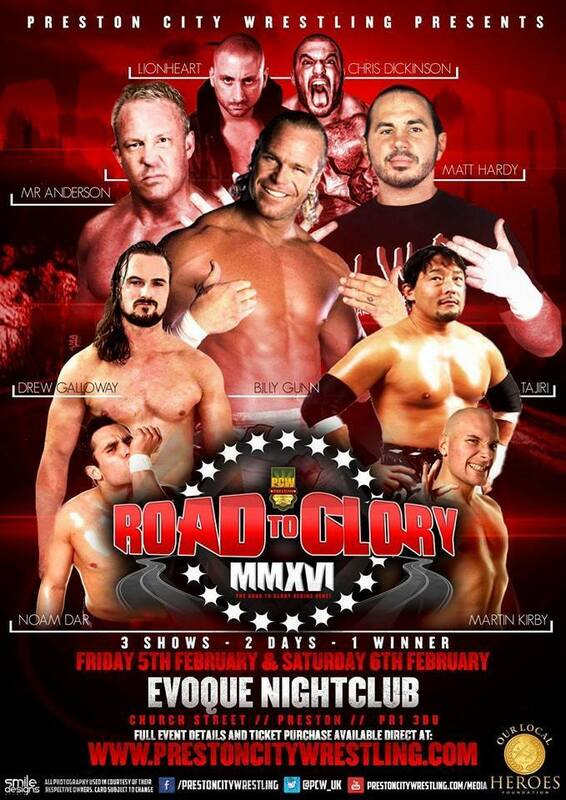 Also this weekend, Preston City Wrestling are holding their annual Road To Glory tournament over three shows this Friday & Saturday. The shows will see a plethora of international names such as Matt Hardy, Billy Gunn and Tajiri to name a few along with some of the best of British. Some very intriguing match ups include Noam Dar vs Timothy Thatcher, Chris Dickinson vs Rampage and Drew Galloway vs Martin Kirby. A whole variety of potential quarter-final, semi-final and final are possible and it is a tournament for anyone to win. Future Pro Wrestling also have a show this weekend. On Saturday they will host 'Reloaded 5.0' at The Thomas Wall Centre in Sutton. A number of matches are scheduled with The GZRS challenging The London Riots for the FPW Tag Team Championship, Jimmy Havoc defending the FPW Championship against Paul Robinson plus the continuation of the FPW Zero-G Championship tournament. There will also be the annual Reloaded Rumble with the winner earning a future FPW Championship match. Speaking of rumble matches, Leicester Championship Wrestling will also be holding their annual rumble match at Brockington College. Along with the rumble where the winner earns a championship match there are four other matches scheduled, three of them for championships. The LCW Tag Team Championship shall be defended in the fatal four-way match, Chris Tyler is defend the LCW Young Guns Championship against Jurgen Heimlich and Xander Cooper will have the odds against him as he defends the LCW Heavyweight Championship in a triple threat match against former champions, Alex Gracie and Joseph Conners.